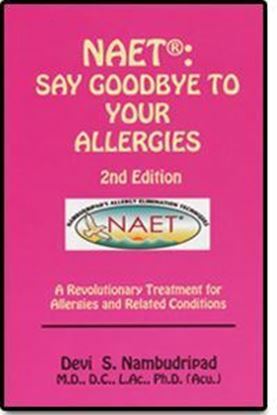 Say Good-bye to Your Allergies 2nd Edition By - Devi S. Nambudripad, M.D., D.C., L.Ac., Ph.D. Paperback-2nd Edition, 2012 181 pages, 8.5’ X 5.5’ X .5’ ISBN: 978-1-934523-19-3 Say Good-bye to Your Allergies will help you understand your illness and will assist you in finding the right help to achieve better health. This book will show you how certain commonly used products can cause health problems; how such problems have a domino effect that can end in serious complications; how your problems can relate to allergy, a traditionally under-diagnosed or misdiagnosed condition; and, how allergies can manifest into myriad symptoms that might seem unrelated. It’s not enough to treat symptoms with medication or a piecemeal therapy. These usually just put a “bandage” on the sore, so to speak. Say Good-bye to Your Allergies gets to the root of health problems and will help you in eliminating their causes. With this book you can now learn how to reprogram your brain (central nervous system) to accept all foods, substances, products, and environments as neutral or beneficial. Not all in one session. You may need many sessions with your practitioner or do it yourself if you have many mild or hidden allergies. You will learn how allergy might have caused your health problems. You will learn how genetic allergies and allergy-related illness can now be controlled. Your brain is an obliging organ that has been searching for ways to help you feel better through much trial and error and various levels of homeostasis (balance). Now it can do the job it has been trying to do. Through NAET, your reprogrammed brain will have learned to accept substances it previously rejected and will allow your body to react normally to the elements of your life so you can get on your way to perfect health. 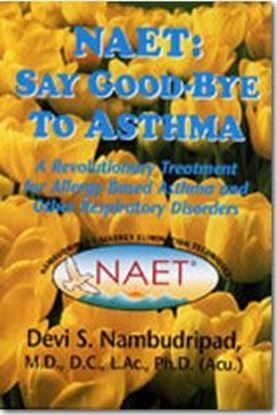 SKU: SGTA_Doc NAET: Say Good-bye to Asthma By - Devi S. Nambudripad, M.D., D.C., L.Ac., Ph.D. Paperback-1st Edition, 2003 350 pages, 8.5’ X 5.5’ X .5’ ISBN: 0-9743915-1-4 Say Good-bye to Asthma will help you understand your illness and will assist you in finding the right help to achieve better health. This book will show you how your life-threatening health problem can trigger from the contact with a simple allergen from your immediate surroundings; allergy, a traditionally under-diagnosed or misdiagnosed condition; and, how allergies can manifest into myriad lung symptoms that might seem unrelated. It’s not enough to treat symptoms with medication or a piecemeal therapy. Medications are good to control the immediate symptoms. When the acute attack is over, one should find the cause and eliminate it so that one doesn’t have to the entire life fighting the repeated acute episodes. Say Good-bye to Asthma gets to the root of health problems and will help you in eliminating their reactions. Anyone who is suffering from asthma should read this book. This natural, non invasive treatment is ideal to treat infants, children, grown-ups, old and debilitated people who suffer from asthma with varied intensities. NAET encourages the use of all medications, supplements or other therapies while going through the NAET program. When the patient gets better, the patient may not require to continue all medications as before. 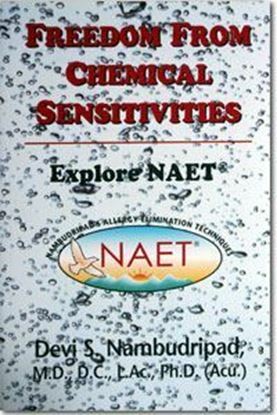 Freedom From Chemical Sensitivities By - Devi S. Nambudripad, M.D., D.C., L.Ac., Ph.D. Paperback-1st Edition, 2006 334 pages, 8.5’ X 5.5’ X .5’ ISBN: 09759277-8-7 Freedom From Chemical Sensitivities will help you understand your environmental illness arising from chemical sensitivities from your surroundings and will assist you in finding the right help to achieve better health. This book will show you how your life-threatening health problem can trigger from the contact with a simple allergen from your immediate man-made surroundings and manmade chemicals that help us keep away from the invasion of bacteria, viruses and parasites. This book will show you how allergies can manifest as incurable environmental illnesses and make you spend rest of your life as a prisoner tomb in your own home. You do not need to live in the allergy prison anymore. You can overcome your abnormal reactions and responses to chemicals, unpleasant odors and the polluted environments and live normally among other normal people side-by-side with other chemicals and chemical products. This book will show you how you can get out of that chemical prison and lead a normal life that you so dearly deserve. Freedom From Chemical sensitivities will get to the root of the environmental illness triggered by chemicals and will help you in eliminating the causes of your illness and achieve your dream of normal living in this planet earth. Anyone who is suffering from Chemical sensitivities should read this book. This natural, non invasive treatment is ideal to treat anyone at any age and in any condition. NAET encourages the use of all medications, supplements or other therapies while going through the NAET program. When the patient gets better, the patient may not require to continue all medications as before. Several mind bogging case studies and testimonials make the book very interesting. 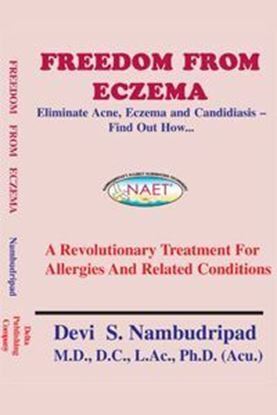 Millions of Americans who suffer from eczema (dermatitis), acne, psoriasis, candidiasis, and other common skin disorders will find helpful new advice in this informative book. Freedom From Eczema is the first to provide a single comprehensive source of diagnostic and treatment options from conventional (Western) and complementary (alternative) medicine, including the popular approach known as Nambudripad’s Allergy Elimination Technique (NAET®). While many conventional and complementary approaches effectively address the symptoms of skin disorders, the NAET® approach addresses the underlying cause of the problem, while encouraging patients to continue care under their regular treating physician until symptoms are resolved. The author, a world-renowned clinician and speaker with 24 years of experience and success with tens of thousands of patients, shows that this integrative approach gives patients both quick and lasting freedom from their skin disorders. Chapters 1 and 2 describe symptoms and causes of common skin disorders, offering evidence of the underlying problem through dramatic before and after photographs of patients who resolved their condition through NAET® treatments. Chapter 3 includes an overview of Western and Oriental medicine diagnostic approaches, including fascinating lists of symptoms of acupuncture/energy meridian disturbance, as well as a thorough description and illustration of the NAET® diagnostic approach. Chapter 4 summarizes conventional, complementary, and NAET® treatment options, and includes self-help acupressure point diagrams for common skin disorders (to accelerate symptomatic relief). 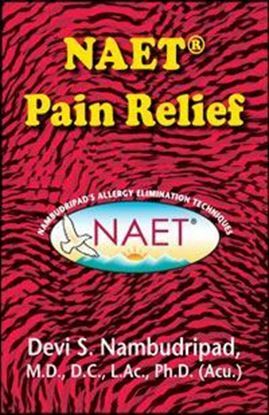 Chapter 5 culminates the NAET® success story with over 35 patient testimonials on how NAET® completely resolved their eczema, acne, psoriasis, candidiasis, and other related symptoms. NAET® is a revolutionary approach that integrates theories from psychoneuroimmunology, energy medicine, chiropractic, and nutritional medicine. Charles G. Gableman, M.D., Diplomate of the American Board of Allergy and Immunology, notes that “It exceeds, by far, any other presently existing treatments for allergies. It is speedy, specific and immediately productive.” Freedom From Eczema is sure to give readers encouraging new answers from this frontier in healthcare. Freedom From Environmental Sensitivities By - Devi S. Nambudripad, M.D., D.C., L.Ac., Ph.D. Paperback-1st Edition, 2005 240 pages, 8.5’ X 5.5’ X .5’ ISBN: 0-9743915-8-1 Freedom From Environmental Sensitivities will help you understand your environmental illness and will assist you in finding the right help to achieve better health. This book will show you how your life-threatening health problem can trigger from the contact with a simple allergen from your immediate surroundings; allergy, a traditionally under-diagnosed or misdiagnosed condition; and, how allergies can manifest as incurable environmental illnesses and make you spend rest of your life as a prisoner in your own home. You do not need to live in the allergy prison anymore. This book will show you how you can get out of that jail and lead a normal life that you so dearly deserve. Freedom From Environmental sensitivities will get to the root of the environmental illness and will help you in eliminating the causes of your illness and achieve your dream of a normal living. Anyone who is suffering from environmental sensitivities should read this book. This natural, non invasive treatment is ideal to treat anyone at any age. NAET encourages the use of all prescribed medications, supplements or other therapies while going through the NAET program. When the patient gets better, the patient may not require to continue all medications as before. Several mind boggling case studies and testimonials make the book very interesting to read. Help is Here for the Injured By - Devi S. Nambudripad, M.D., D.C., L.Ac., Ph.D. Paperback-1st Edition: September, 2009 ISBN: 978-1-934523-10-0 This book will show you how certain commonly used products can cause or aggravate various types of pain and health problems; how such problems have a domino effect that can end in serious complications; how your problems can relate to allergy, a tradition-ally under-diagnosed or misdiagnosed condition; and how allergies can manifest into myriad symptoms that might seem unrelated. Say Good-bye to Headaches By - Devi S. Nambudripad, M.D., D.C., L.Ac., Ph.D. Paperback-1st Edition, 2007 370 pages, 8.5’ X 5.5’ X .5’ ISBN: 0-975927760 Say Good-bye to Headaches will help you understand your illness and will assist you in finding the right help to achieve better health to reduce or eliminate your headaches whether acute or chronic. This book will show you how certain commonly used products can cause your headaches; how your headaches can be triggered from an allergy, a traditionally under-diagnosed or misdiagnosed condition; and, how allergies can manifest into various types of headaches that might seem unrelated. It’s not enough to treat symptoms with medication or a piecemeal therapy. These usually just put a “bandage” on the sore, so to speak. Say Good-bye to Headaches gets to the root of the causes and will help you in eliminating the causes of your headaches so that the headaches will never appear again. With this book you can now learn how to reprogram your brain (central nervous system) to accept all foods, substances, products, and environments as neutral or beneficial. Not all in one session. You may need many sessions with your practitioner or do it yourself if you have many mild or hidden allergies. You will learn how genetic allergies and allergy-related illness can now be controlled. Your brain is an obliging organ that has been searching for ways to help you feel better through much trial and error and various levels of homeostasis (balance). Now it can do the job it has been trying to do. 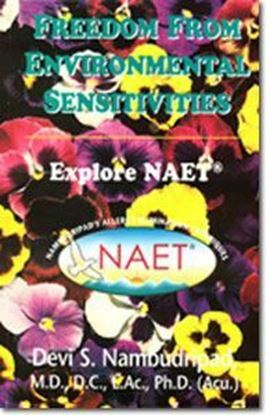 Through NAET, your reprogrammed brain will have learned to accept substances it previously rejected and will allow your body to react normally to the elements of your life so you can live happily away from the control of your headaches. Testimonials and interesting case studies will help you want to seek the NAET treatment as soon as you can and stay with it until you achieve maximum benefit for you from the treatment-that is to SAY GOOD-BYE TO HEADACHES forever. 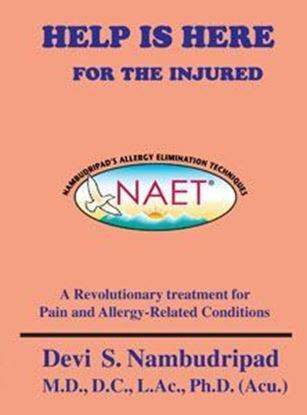 NAET: Pain Relief By - Devi S. Nambudripad, M.D., D.C., L.Ac., Ph.D. Paperback-1st Edition, Sept. 2008 379 pages, 8.5’ X 5.25’ X .75’ ISBN: 978-1-934523-07-0 Anyone who is suffering from pain due to unknown causes, or if they know that they have food and environmental allergies or anyone suffering from an allergy-related disease or condition should read this book, this natural, non invasive techniques is ideal to treat infants, children, grown-ups, old and debilitated people who suffer from mild to severe allergic reactions without altering their current plan of treatment NAET® program. When the patient gets better, the patient's regular physician can reduce or alter the dosage of drugs.